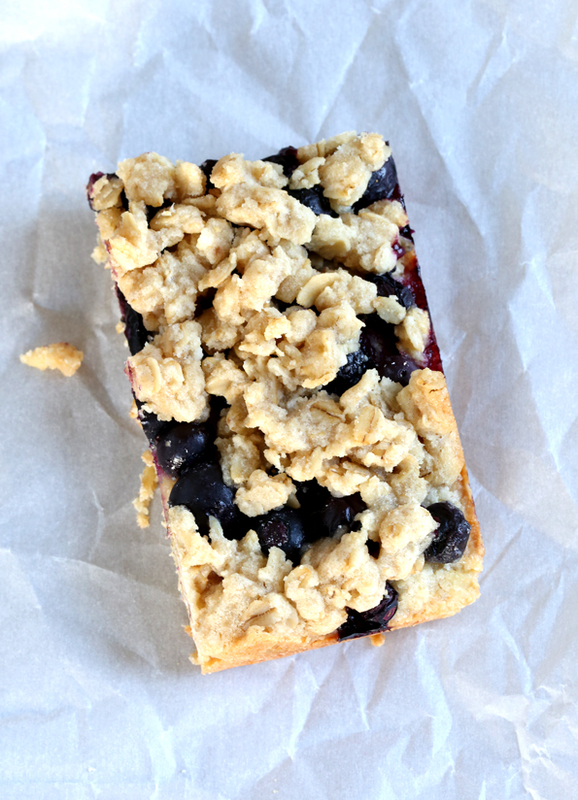 Starbucks-Style Gluten Free Blueberry Oat Bars | Great gluten free recipes for every occasion. Tired of staring sadly at all the treats you can’t have in the Starbucks glass case? 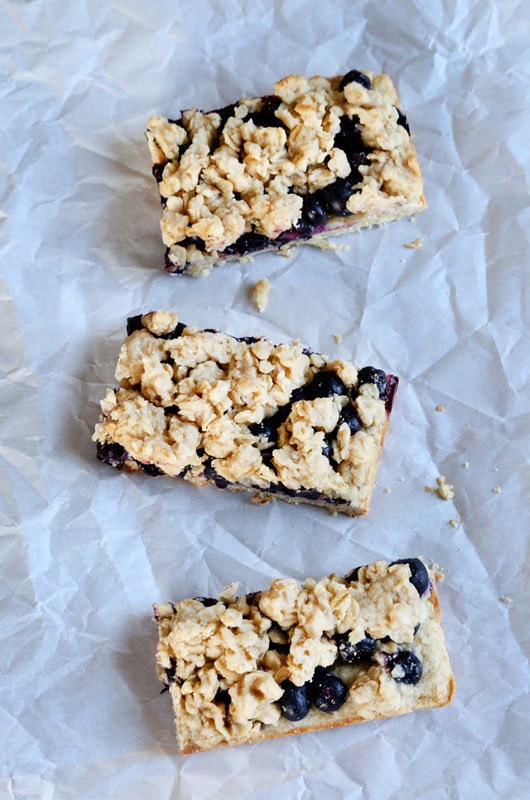 These gluten free blueberry oat bars, with an oat-shortbread crust, a thick layer of blueberries (fresh or frozen) and a crispy crumb topping, make it all better. Whether it’s blueberry season or not (as I type this, it’s no! ), this recipe for Starbucks-Style Gluten Free Blueberry Oat Bars is not something you should be without for much longer. If you are going to take an Alice Watersesque stand against eating fresh blueberries out of season (I salute you! ), just use frozen blueberries (don’t defrost them). The crust is like an oat-shortbread. It’s buttery and kinda crumbly, with the slight chew of oats mixed in. 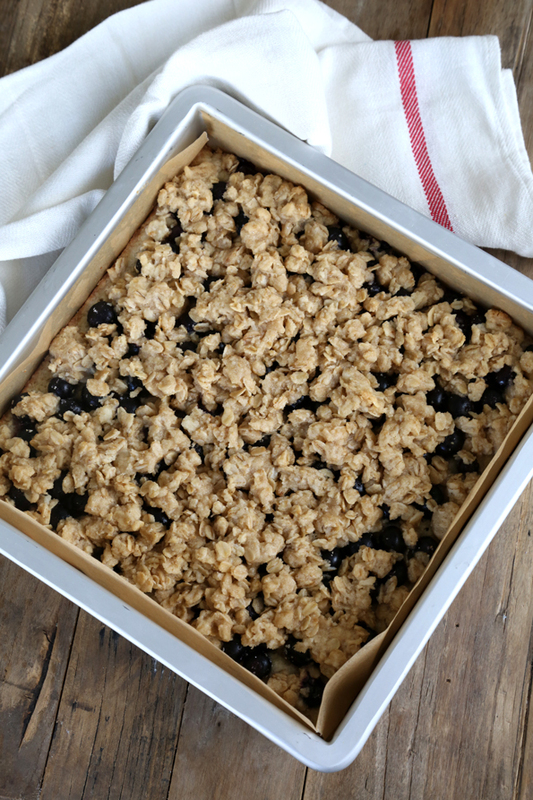 The crumble topping is just what you’d expect from the perfect texture of a nice crumble topping—but studded with oats. And can you see how the blueberries keep their shape? That’s because the crust doesn’t take long to bake. And since we want to keep the crumble topping from browning too much, we just don’t bake the whole thing for too long not too long at all. Frozen berries will leak a bit more than fresh ones, but even the frozen ones should hold their shape relatively well. This is just my imagining of what the Starbucks Blueberry Oat Bars are like. I’ve never actually had them myself. So I went from the ingredients … and one single photo. 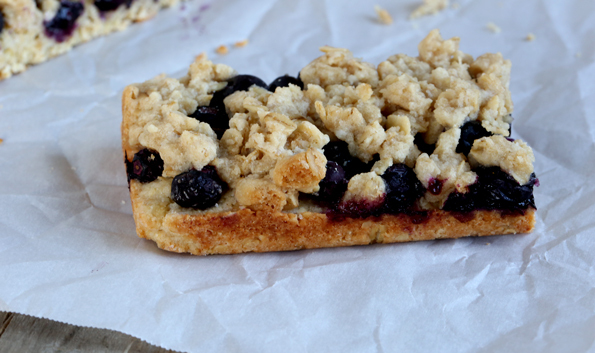 If you’ve had these blueberry oat bars from Starbucks, I hope I did you proud. The moral of the story is always the same: If they can make it with gluten, we can make it without! Preheat your oven to 325°F. Grease a 9-inch square baking pan, and line with crisscrossed sheets of unbleached parchment paper to make it easy to lift the bars out of the pan after baking. Make the crumble topping. Combine all of the topping ingredients (8 tablespoons butter, 1/2 cup all purpose flour and xanthan gum, rolled oats, granulated and brown sugars, and salt), and blend with a fork until well-combined. Place in the refrigerator to chill until ready to use. Make the crust. In a large bowl, place the all purpose flour, xanthan gum, oat flour, salt, baking powder and granulated sugar, and whisk to combine well. Add the oats, and mix to combine. Create a well in the center of the dry ingredients, and add the butter, egg and 1 tablespoon water, and mix to combine. The dough will be a bit dry, and you will have to knead it with your hands to get it to come together. If necessary for the dough to hold together, add a second tablespoon of water, 1 teaspoon at a time. Transfer the dough to the prepared baking pan, and press firmly into an even layer on the bottom of the pan. Cover with another sheet of unbleached parchment paper and smooth out the dough by pressing it down evenly. Place the pan in the center of the preheated oven and bake for 5 minutes. While the crust is parbaking, in a small bowl, place the blueberries, sugar, oat flour and salt, and toss to combine. After the crust is done parbaking, remove the pan from the oven and spread the blueberries out on top of the crust in a single, even layer. Remove the crumble topping from the refrigerator and fluff it with a fork to break it up into irregular pieces. 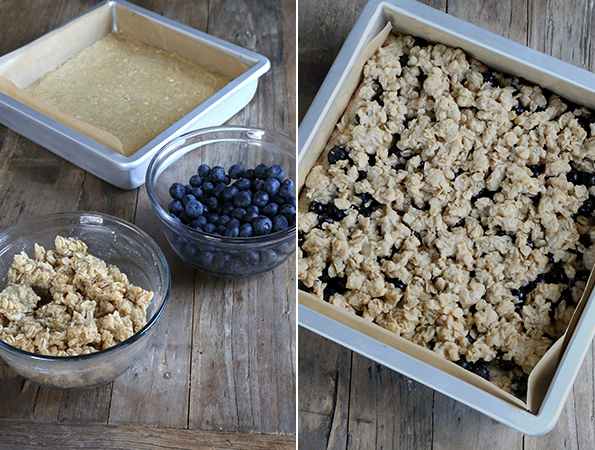 Sprinkle the crumble topping in an even layer on top of the blueberries. Return the pan to the oven, and bake until the crust is beginning to brown around the edges, a toothpick inserted into it comes out clean and the crumb topping is very lightly golden brown (about 17 minutes). Remove the pan from the oven and allow to cool completely in the baking pan before lifting the bars out of the pan with the parchment paper. Slice into 8 to 12 equal pieces, depending upon how large you’d like the bars. P.S. I hope you’ll pick up your copy of Gluten Free on a Shoestring Bakes Bread today! Your support makes the blog (and more books!) possible, and I really appreciate that. More than you know. I had the kids whip these up last night for breakfast this morning — delicious! For my very first post :D … I would like to say how lovely these bars sound and look. How ever I have yet to find gluten free oats here in New Zealand. Maybe I will try with quinoa flakes (??). I know it wont be the same as your yummy original bars but I’m not sure I can wait for gluten free oats to be available here! I’d also like to say thank you, Nicole, for your lovely books and site. I have two of your books and have been looking forward to purchasing your GFOAS Bakes Bread since before it’s release!! But the time I has finally arrived for me to order it! Now I just have to wait for it to arrive. Thanks again hun! I made this last Friday, and they tasted amazing. Everyone loved them! I even managed to source some gluten free oats!! Bonus!! Yet another post that I want to make IMMEDIATELY. And I got a much needed dose of humor… never eaten them, made from picture. Love. Off to raid my kitchen. Hi Nicole, I have recently discovered your blog here in Australia and just love it. Prior to going GF 18 months ago I was an avid cook (especially loving baking) but have really struggled since then. Your blog has inspired me again and everything I have cooked from it has really impressed my friends and family – love it. I just ordered your baking cook book and I am impatiently waiting for it to arrive. I cannot wait to try this recipe. Thanks for the inspiration. I honestly don’t know if they would work as individual cakes, Allison. They really are very much a bar cookie. I’d bake them in a pan, cut them up, and then wrap each individually. They store well in the refrig, or in the freezer. Perfect …I love oat bars and even have all the ingredients handy . I look forward to making these very soon . This afternoon is not out of the question . Thanks Nicole for all you hard work in developing your recipes . I have all three of your books . This afternoon sounds like the perfect time, Sheree! And thank you so much for supporting me by buying the books. That means so much! I have not eaten these in ages, but I sure did love them. I am headed to the pantry right now to see if I have all the ingredients on hand! I have all 3 cookbooks and am beyond excited for the newest one in the works! Yeah! Your enthusiasm is contagious, Jennifer! Can I omit the xantham gum? I really don’t like the taste of it and can’t eat items that contain it. Thanks! Also, do you have a Sweet Tomatoes or Souplantation near you? They currently have an amazing gluten free coconut muffin that I am dying to try to recreate but have no idea where to start! Do you have any recipes for coconut muffins? Thanks!! I haven’t tried this recipe without xanthan gum, Meghan, but I believe it would fall apart. I would not omit it. I have never heard of Sweet Tomatoes or Souplantation. Sorry! I do have a recipe for coconut cupcakes on the blog. Just use the search function! Thanks I will search for it now! I am fairly new to gluten free and just learning all the ins and outs. Are there any substitutions for xantham gum? You can usually sub guar gum, although I’m not sure if it’s a 1:1 ratio. Yum! I cannot WAIT for this new cookbook!! My hubby was so excited about the chalupas! LOL! He’s started sending my pictures of your posts before I even get to them in the morning! Now I hate to be “that guy” but….do you think I could get away with frozen blueberries? Just curious. Oh, John, you have swooped and saved me so many times you’ll never ever be “that guy”! Yes you could totally use frozen berries (that’s the Alice Waters comment in the post ;). Don’t defrost them. They will “bleed” more than fresh, but the taste will still be fab. Oh NO! I AM that guy!!! I didn’t read!! . I was so excited (and a bit distracted at work) that I went right to the ingredients and missed the actual blog post…. Boo. My apologies. That being said, I love all things blueberries so I will try these this weekend. Your “lighter” blueberry muffins are still a “regular” thing in our home. They. Are. So. Good.